Why Choose the School Counseling Program? The Master’s of Education in School Counseling program at Wright State University has been nationally accredited by the Council of Counseling and Related Educational Programs (CACREP) since 1989. The current term of accreditation for School Counseling expires on October 31, 2019. Our program prepares school counseling professionals to provide services to students in kindergarten through 12th grade educational settings. Our curriculum emphasizes counseling approaches, lifespan development and comprehensive school counseling program models including courses in crisis counseling, counseling exceptional students, student problematic behaviors and family systems. Master’s degree school counseling students develop professional skills such as consultation, collaboration, leadership, and advocacy to work with children and adolescents facing complex social, educational, and other pressures faced in today’s world. Included in our 60 credit hour program is a one semester practicum and two semester internship. These hands on practical field experiences allow students to participate in a one and a half academic year professional training under the supervision of a professional school counselor supervisor. Graduates of our School Counselor Program are eligible for the Ohio Assessments for Educators (OAE) licensure examination. Our graduates consistently achieve high pass rates on licensure examinations. *Represents the percentage of students that graduated within the 3 year (or 9 semesters) expected time frame. Please note, graduate counseling programs do not require students to attend full-time and many choose to attend part-time. Represents the percentage of students who were employed in the field within six months of graduation. Include a statement of educational and professional goals. The practical experience provided through a practicum experience is a critical component of all counselor education programs. The counseling practicum is meant to be a culminating experience, in that the student should be able to display essential knowledge, skills, and values in an actual kindergarten -12th grade school setting. Through this experience students engage in all of the day to day responsibilities and roles of professional school counselors. All School Counseling Master’s Degree students are required to secure a practicum site and professional school counselor supervisor from whom students will receive direct professional guidance and direction. Students normally enter the practicum with a common core of academic experiences. 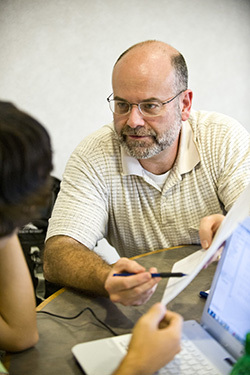 Practicum students will have completed coursework related to the basic principles and procedures utilized by professional counselors, and will have been exposed to the major theories and techniques of counseling. A Program of Study form must be completed and on file in the Department of Human Services Office prior to students submitting an application for practicum. It is recommended that School Counseling Master’s Degree students complete the practicum in during the spring or fall semester at a kindergarten-12th grade educational facility. School Counseling Students must complete the following courses PRIOR to beginning practicum. *CNL 6200 Clinical Pathology in Counseling is only required if completing practicum at a clinical mental health counseling site. Students must submit applications for both practicum and internship each semester. Please see handbook for specific information related to application on materials. Applications and paperwork apply for one semester only-students MUST apply each semester they plan to register for Internship.The student must supply verification of liability insurance at the time of each application. A photocopy of the insurance application and check will not fulfill this requirement. The student can provide a copy of the policy or anything that states their name and the dates that they will be covered by the insurance. Student applications to join the American Counseling Association (ACA) and applications for ACA Professional Liability Insurance are available in 108 Allyn Hall. Students may also join the ASCA for Professional Liability Insurance. The student is required to spend a minimum of 7 hours per week* (for a minimum total of 100 hours per semester) at his/her site; however, a site may require additional hours. Students are strongly encouraged to exceed the minimum number of required counseling hours per week. Of the 100 hours, a minimum total of 40 hours must involve direct client/student contact.Of these 40 hours, at least 25 percent (10 hours) must be of individual counseling and at least 25 percent (10 hours) must be of group counseling. The remaining 50 percent (20 hours) may be a combination of counseling: individuals, groups, couples, families, consultation, and appraisal. In addition, one hour per week must be direct individual supervision of the practicum student by the site supervisor. For purposes of critique and evaluation, two video tapes are required for review during site supervision sessions and class meetings. Intake interviews alone will not fulfill these requirements. Students have the responsibility for following site procedures, both for securing permission to tape and insuring the confidentiality of the obtained tape. *Wright State University’s summer semesters are schedule for 12-weeks. Students registered for Practicum during a summer semester will be required to spend a minimum of 9 hours per week at the practicum site, in order to obtain the minimum 100 hours required for practicum. However, it is recommended that School Counseling Master’s Degree students enroll in practicum only during the regular academic year (fall or spring semester). Students must be supervised by a professional school counselor licensed or certified by the Ohio Department of Education with a Master’s Degree in School Counseling and at least 2 years of experience as a school counselor. The student is required to complete a total of 6 credit hours of CNL 8670 for a minimum of 600 clock hours at his/her internship site with a minimum of 240 direct client contact clock hours. One credit hour equals 100 clock hours on site. The following are minimum internship requirements. In addition to completing the requirements for practicum, the practicum (CNL 8650) must be completed. OAE School Counselor Exam or department comprehensive exam results (evidence of passing). Note: Students must pass the OAE School Counselor Exam for Ohio School Counselor licensure. Students who pass the OAE are not required to take the department comprehensive exam. Submit all Key Assessments to Task Stream before the last semester of internship. In 2015, there were 11 graduates of Wright State University's School Counseling program. Currently we have 54 students enrolled in our School Counseling program. Our graduates consistently achieve high pass rates on licensing examinations. The pass rate for graduates taking the Ohio Assessments for Educators (OAE) licensure examination in 2016-2017 was 90%. Of the admitted students, 85% graduate from the program in the expected time period. 70% of School Counseling graduates were employed in the field within six months of graduation.